I picked up Buddy at the Rochester shelter. He is underweight but otherwise seems in good condition. He is a wonderful boy. He is friendly with everyone, gets along with all of my dogs and cats. He is housebroken and nicely behaved. He is so active I can't believe he's 13. He will play fetch with a ball forever and keeps up with my younger guys on walks with no problem. 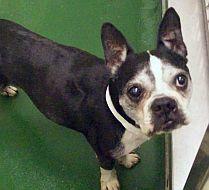 I'm hoping there is someone out there who will look past Buddy's age and offer him a forever home. He has a lot of life left in him and is a very loving dog. 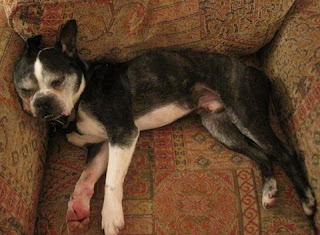 Note: Parker found himself at animal control in Philly and was pulled on day two of his 48 hour hold before begin PTS. Someone from another rescue had to actually pull him and hold him until Jodi could get there because his time was literally up. Now look at him happy, healthy and more importantly, alive! YAY!!!! 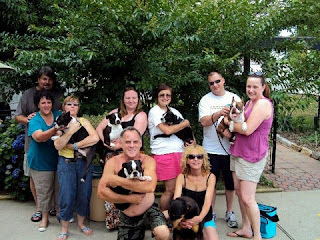 "Anne, the forever mom, just emailed me about Parker, a dog we fostered last may through July (with some help from Jodi). It's stories like this that remind us of what we do! "Parker has decided that he really likes my husband, Ken. He bonded with me right away but stayed cool toward Ken. Ken has been home for a couple of weeks with a bad gall bladder, it was removed today. Parker and Ken have now become fast friends. Parker now looks for him and is visibly excited to see him. Parker has also made friends with my daughter's dog, Bear, a black lab (female). He has become a real asset to our family. We enjoy our walks and play time together. I am sending you a picture of Parker and Ken sitting together. Our best wishes for more successful adoptions. Anne Swain"
May 11, 2010 (WHEELING, Ill.) (WLS) -- Frankie is one lucky dog! 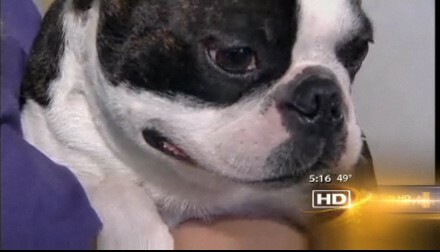 The Boston terrier who traveled miles from Michigan to Illinois is now headed home. Tuesday Frankie went from lost to found. 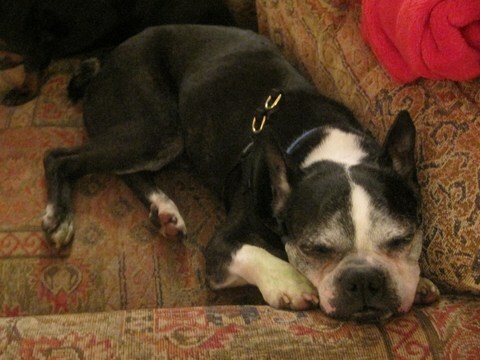 The Boston terrier has been missing since January from his Michigan farm. On Saturday, he was found in the suburbs and taken to the Wheeling Animal and Pet Resort, where vets found a microchip that identified him. "Definitely lucky. We have a contract with the wheeling police and they bring in lost or stray dogs," said Alyssa Roberts, Wheeling Animal Hospital. "No collars, to tags, and he followed me to my front door," said Mark Feldstein, dog rescuer.Frankie's family from Battle Creek, Michigan, was located from the microchip. They drove down to get the dog. 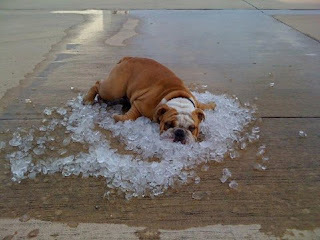 "I'm very excited, said Denise Shepard, Frankie's owner. "Five months he's been gone." And with that the two were reunited. And a howling good reunion it was. Note: This was written by Gracy's forever family to her foster mom, Molly, who did such a wonderful job with little Gracy. Hannah and Marc drove 5 hours to meet her and then spent the entire day getting to know her and working on trying to get Gracy to accept their dog, Olive. Molly writes, "They're a really kind, patient young couple who have given Gracy a wonderful home and are working really hard on training and behavior issues with her. Gracy and Olive have become best friends and Marc and Hannah are very happy with Gracy. I'm sure Gracy is loving her new life!" Just wanted to give you another update on Gracy. She is such a great little girl, and I think she's really blossoming. Her and Olive are getting along fantastically. Practically best buds already. They play, and play fight. We all go on walks together. Gracy is even sleeping in the bed with us now, and she doesn't even growl or snap at Olive. She is however, not a morning dog. I get up fairly early for work and Olive is ready to go before my alarm even goes off, but Gracy just lifts her head and looks at me as if to say, "Are you kidding, no way am I getting up right now." She likes to keep sleeping with Marc, she even snuggles into his back. Her digestion issues seem to be resolved. She's eating heartily and has very regular and consistent poops. We are currently in the process of transferring her for the food our vet prescribed to the food we make for Olive. She seems to enjoy and even dances a little when its time to eat. She's a total beggar. Now that she has mastered sitting on command we're working on coming when called. So far she complies about half of the time, but we're using positive reinforcement training, and lots of treats, which more often than not get her attention. Gracy is a wonderful little dog, and I am so happy that we were able to bring her into our family. It already seems as if she's been here the whole time. She and Olive spend hours wrestling and barking at strange noises or things that aren't there, and playing tug of war. I even have a picture. We had a great day and shared stories and food. I send my NJ girls Amy & Gilda home with NY bagels (lol). From left to right is Diane & Norman Laudani - Joan and Bentley - yes my foster Bentley - Amy Angelo and my Ivy - Gilda Hunt and her foster girl with 25 names she was called all day (you had to be here ) - Sonya & Ron Wilcox & their Petey (she is my hc queen) - My Steve a/k/a Bunky with Duke and me Linda and my Rottie Maggie. Maria E. came later and was left out of the pic with her two kids & her BT Cody. Gilda and Amy - I love you more than apple pie. Sonya did you bring the apple pie. Who made those cookies that I had to fight the kids for?